Limited internet access and a bout of influenza has kept me away from this blog for a while, but in the meantime I completed site visits of PLEA in Saskatoon and CLEA in Winnipeg. With these visits I have now visited every Canadian province and all the major sole-purpose PLE providers in Canada outside of the territories. The Public Legal Education Association of Saskatchewan, headquartered in Saskatoon, began in 1980 in the basement of the Saskatoon Public Library. In the 27 years since, it has continued to serve Saskatchewan (current population: about 988,000) as the province’s only sole-purpose public legal education provider. At the core of PLEA’s programming are plain language publications and youth and schools programming including curricular materials. Other ongoing programs include regular newspaper articles, a speakers bureau, and intermediary training. A website provides access to the organization’s publications and information about its various programs. The Community Legal Education Association, incorporated in Winnipeg in 1984, is Manitoba’s sole-purpose PLE organization. CLEA’s biggest program is a lawyer-staffed legal hotline and lawyer referral service. Additional core programming includes plain language publications, intermediary training, a provincial legal services directory, a speakers bureau, and a website. Based in what is surely Canada’s most under-appreciated major city, CLEA is unique among sole-purpose PLE providers in that it receives substantial annual financial support from its province’s law society. A “No Vacancy” sign was the first indication that I was successfully navigating my way through a west Edmonton hotel and conference centre to the 2006 Edmonton Apartment Association (EAA) trade show. EAA is an organization for landlords, land owners, and property managers, and so I guess “No Vacancy” is a good and reassuring thing to its membership. As a perpetual tenant, I’d not normally be found at a landlords’ conference, but last Tuesday I was going to their trade show to watch the Legal Studies Program (LSP) in action, hawking its “Laws for Landlords and Tenants in Alberta” project. “Hawking” may not be the most appropriate word, because LSP’s was the only non-governmental booth at the show that was not selling something. LSP was nestled in between an appliance vendor and a locksmith, tucked near the corner of a floor dominated as you would expect by carpet stores, property listing websites, security companies, a business called “Trauma Scene Bio Services,” and so on. Yet “dominated,” too, might not be the best word, since the LSP booth commanded at least as much traffic as the most popular of the for-profit offerings. Indeed, when I first arrived it was the throng of people surrounding two nametagged women and a small table that turned out to be LSP’s spot. The two women, LSP staffers Lesley Conley and Kirsten Wurmann, confirmed that the high traffic at my arrival was not completely anomalous. During just my hour-long visit, about 30 people visited the booth, most taking some of the free materials and many chatting with Lesley and Kirsten about both general and specific questions. Most of the questions had to do with tenant disputes, but some frequent queries—about the law as to bedbugs, for example—were new and surprising and aren’t yet covered on the LSP’s Laws for Landlords in Alberta website. I did not stay for the afternoon trade show seminar on bedbugs. As I was walking out, I did hear Edmonton Oilers President Patrick LaForge try a joke and get absolutely no response from the handful of attendees who had gathered for his keynote address. The LSP might, in fact, have been drawing a bigger crowd at that moment. 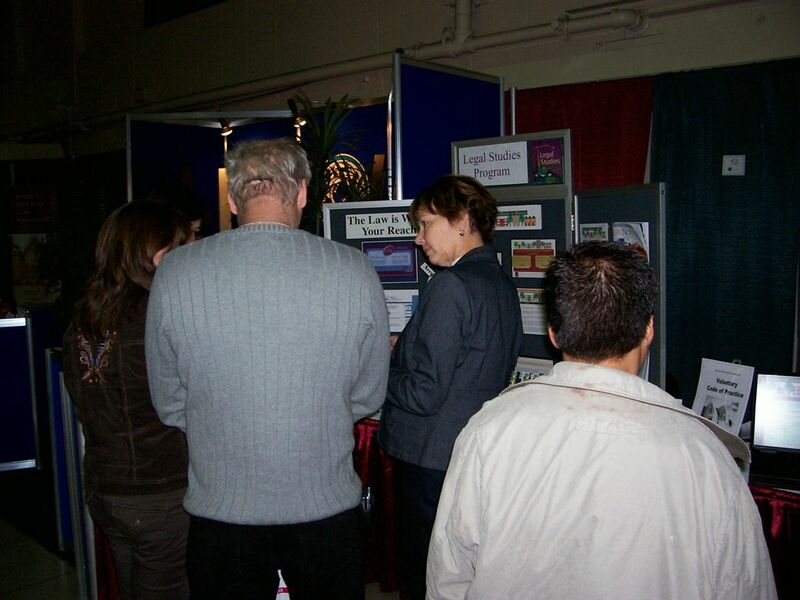 Following the EAA trade show, LSP travelled to Calgary (without me) for another apartment association trade show.